UP B.Ed Admit Card 2019: The exam of UP B.Ed 2019 will be held by Mahatma Jyotiba Phule Rohilkhand University, Bareilly for the admission to B.Ed Course. The exam is conducted every for granting admission to the eligible and qualified candidates to state Government aided colleges for pursuing B.Ed for 2 years. Up B.Ed Admit Card 2019 is released on the official website on 8th April 2019. The candidates who have filled up the Application form successfully will be able to download it. It is necessary to provide the required credentials in the login section for accessing the UP B.Ed Admit Card. The Admit Card contains all the important information required on the day of the exam. For more of the details of UP B.Ed Admit Card 2019 go through the article below. New: The Admit Card of UP B.Ed 2019 is now available from 8th April 2019. Candidates must download it by providing the asked details in the login section. 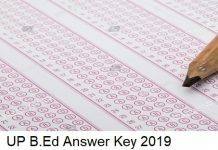 UP B.Ed 2019 exam is on 15th April 2019. 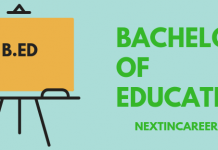 Donwload UP B.Ed Admit Card 2019 here. Candidates who will be appearing for UP B.Ed 2019 exam is required to download the Admit Card from the official website. The link of UP B.Ed Admit Card 2019 is made available as per the notified date on the officially released schedule. It is a mandatory document which the candidate needs to bring on the day of the exam. It should be noted that the absence of UP B.Ed Admit Card 2019 on the examination day will prohibit the candidate from appearing for the exam. Admit card provides validity to the candidate. The Admit Card of UP B.Ed 2019 is available in an online mode and no other mode is available. Once UP B.Ed 2019 Admit card has been downloaded, candidates are required to paste their passport size photograph and put up the thumb impression in the given space on the Admit card. The specifications are mentioned in the information brochure. It is important to go through these steps, the admit card will not be acceptable otherwise. We have mentioned the steps below in order to download the Admit Card successfully. Candidates will have to provide the necessary credentials to access the Admit Card. Go through the points mentioned. Visit the official website and go on the B.Ed Admission Portal. Navigate for UP B.Ed Admit card 2019 and click on the available link. The Login section will ask for User ID and Password to access the Admit Card. Admit card will appear on the screen for download. Go through the details mentioned on the Admit Card of UP B.Ed 2019 very carefully. In case of any discrepancy, contact the examination conducting body immediately. If satisfied, download UP B.Ed Admit card and save it. Get multiple printout copies of the Admit card in case the one downloaded gets lost or damaged. After providing the correct credentials in the Login section, candidates must go through the details mentioned on UP B.Ed Admit Card 2019 very carefully. The Admit Card mentions all the necessary details important for the candidates on the day of the entrance exam. In case of any discrepancy in the details mentioned, candidates are advised to contact the examination conducting body immediately. Venue of the entrance exam. The Admit Card of UP B.Ed 2019 is mandatory to be carried on the day of the exam. Candidates without the Admit Card will not be allowed to appear for the exam. The downloaded Admit Card should be kept with the utmost care and any form of damage will prohibit the candidate from giving the test. The details mentioned on UP B.Ed Admit Card 2019 are provided by the authorities of examination body. Any form of editing or changes in the details of the Admit Card will not be permissible. Candidates appearing for UP B.Ed 2019 exam will be required to bring one original Photo ID for the verification. The details mentioned on UP B.Ed Admit Card 2019 should be read very carefully by the candidate. In case of any discrepancy, the examination authorities should be immediately contacted. The venue of the exam which will be mentioned on the Admit Card cannot be changed in any circumstances. Any form of request regarding the changes in the centre of the exam will not acceptable. Candidates who will apply for UP B.Ed 2019 exam will be required to bring documents on the day of the exam along with the Admit card/Hall Ticket. It should be noted that the candidate will not be allowed to enter the examination hall if the documents are not present. The checking and verification of UP B.Ed JEE 2019 Hall Ticket will be done before the commencement of the exam. Candidate should get at least two to three copies of UP B.Ed Admit Card 2019. In case the original or downloaded one gets lost or damaged. The photocopies of ID should also be bought along with the original copy of Photo ID. Candidate must also bring recent passport size photograph as uploaded in the Application Form.